The brief for this exercise was quite short but had a lot of key words in it. To ensure I produced something that fulfilled all the criteria, I started with a mind map of the key information from the brief. My initial research then stemmed from this. 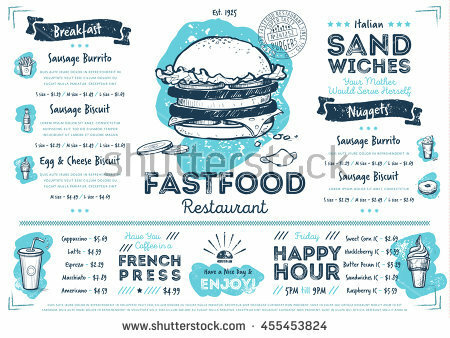 I wanted to look at some menu illustration from restaurants similar to the one described in the brief. I looked into European chain restaurants but these tend to be fast food places, not sophisticated, quality restaurants and there didn’t seem to be any seafood restaurant chains. America has some seafood chain restaurants so I looked at some of their menus online. ‘The Red Lobster’ has photos along the top of their website and no illustration. ‘Joe’s Crab Shack’ has no visuals at all. The website of ‘Bonefish Grill’ isn’t available in the UK but they do have an illustration of a fish as their logo that was visible. It is a simple line drawing of the bones and head of a fish. It appears as a gold, black or white outline in different versions of the logo. None of these restaurants appeared to be sophisticated so I then researched some European seafood restaurants. Although not solely serving seafood, ‘La Maquina’ is a chain of restaurants in Spain that serve a lot of fish. They have photos of food on their website and a plain menu as shown below. I looked at various other European restaurants that look sophisticated and quality on the basis of their websites and recommendations by food writers including ‘L’Epuisette in Marseille, ‘Les Fables de la Fontaine’ in Paris and ‘Fiskebar’ in Copenhagen. All of these have photos and plain menus. As this line of research wasn’t yielding any results, I decided to look into non specific menu illustration. This was rather uninspiring though with a lot of it being variants of generic shutterstock images as shown below. All of these are line drawings, either graphite or ink, and inverted digitally in the case of the one on the black background. The illustrations have quite a bit of detail, but because they are line drawings, they remain clear. The food doesn’t actually look appetising to me though, perhaps due to the lack of colour. 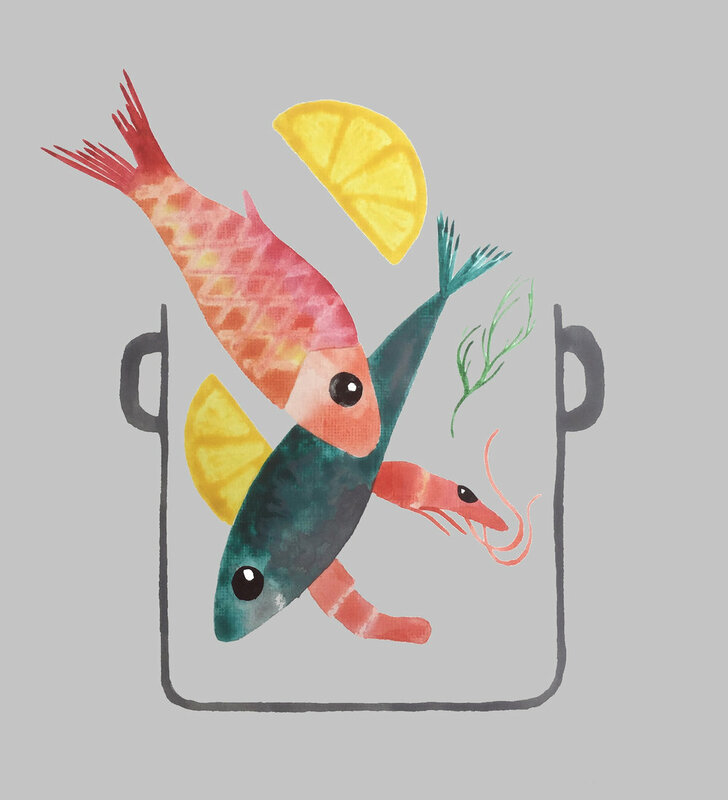 At this point I decided to look at food illustrators instead, with different parts of the brief in mind. The illustration I had to produce may possibly be used as a logo in addition to being on the menu meaning it needs to be simple and clear. The restaurant has a modern, bright and contemporary design. 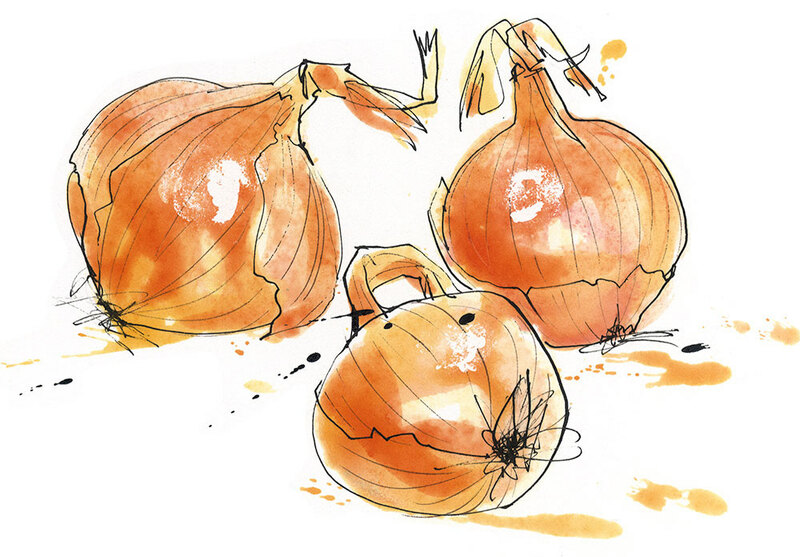 With these points in mind I analysed the work of some different food illustrators. Below are illustrations created by Emma Dibben (photos from her website, www.emmadibben.com). Her food illustration is very detailed and have an almost vintage quality to them. They are well observed drawings without stylisation and the colours are kept life like. 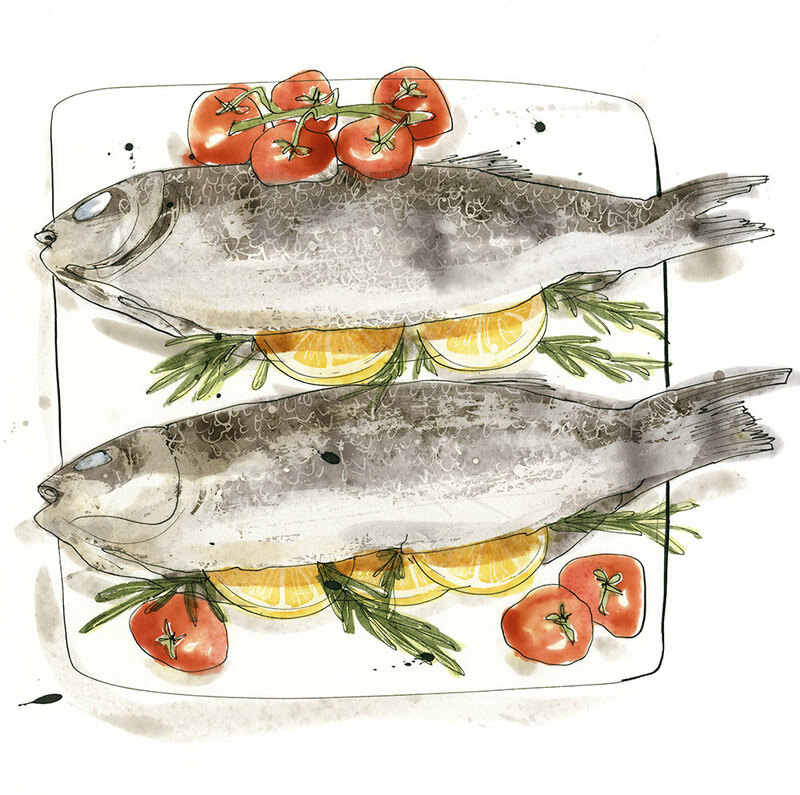 The splashes of watercolour or ink around the food give it a sense of life, a vibrancy. Although beautiful and very appetising, I don’t think this style of food illustration is simple enough for a logo. I’m not sure it is contemporary enough either. Margarete Gockel’s work has similarities to Louise Morgan’s in that she uses black ink, and her application of colour is non conformist. It is a lot more contemporary though, perhaps due to the very thick, bold black lines, ink splodges and addition of texture that can be seen on the belly of the fish. 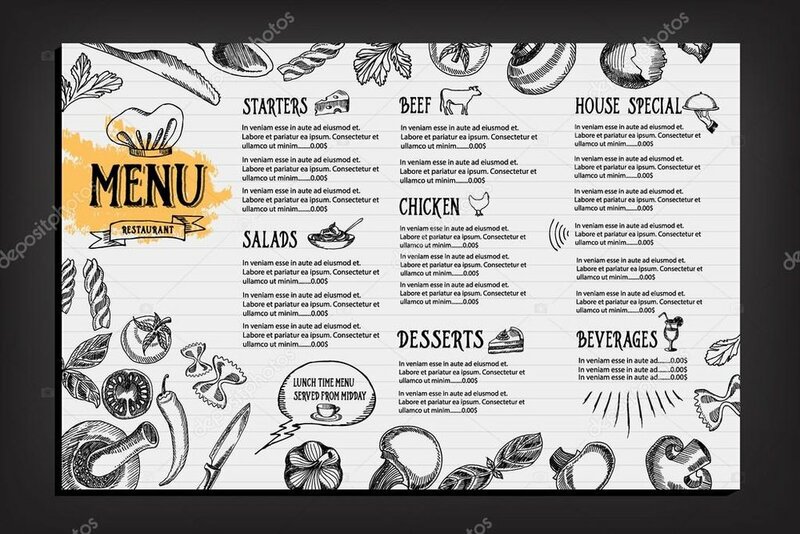 The food doesn’t look as appealing to eat, but this style would suit a restaurant with a modern, bright contemporary design and is simple enough for a logo. Images from agent website, www.traffic-nyc.com. Moving forward to making my own artwork, I went back to my mind map to check I was fulfilling all parts of the brief. Another aspect of it was that the restaurant uses fresh ingredients and this is something I wanted to portray in my illustration. I wanted to show the cooking of fresh ingredients in a simple clear way. 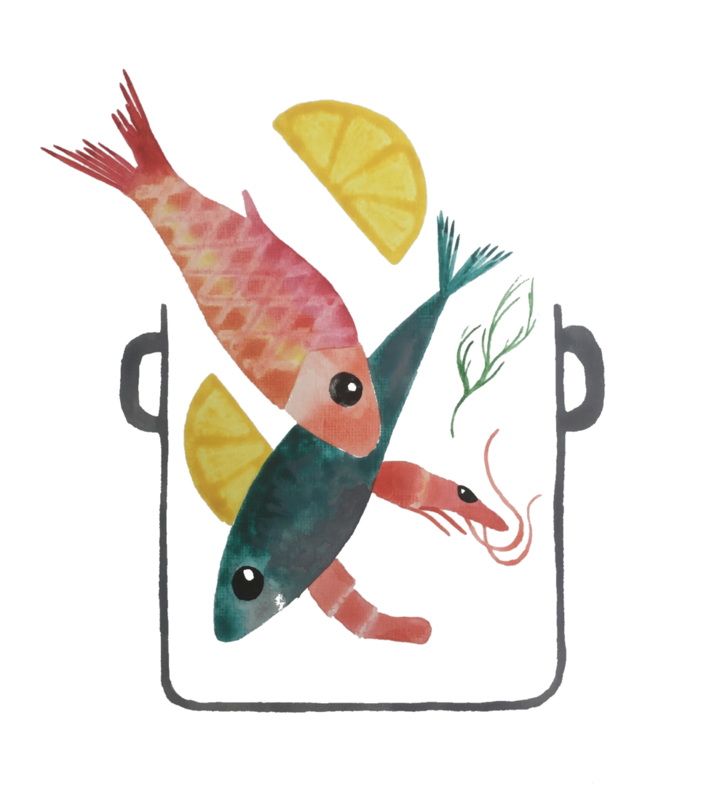 I looked at images of different types of seafood and chose a few to sketch that I thought would work well in my illustration. 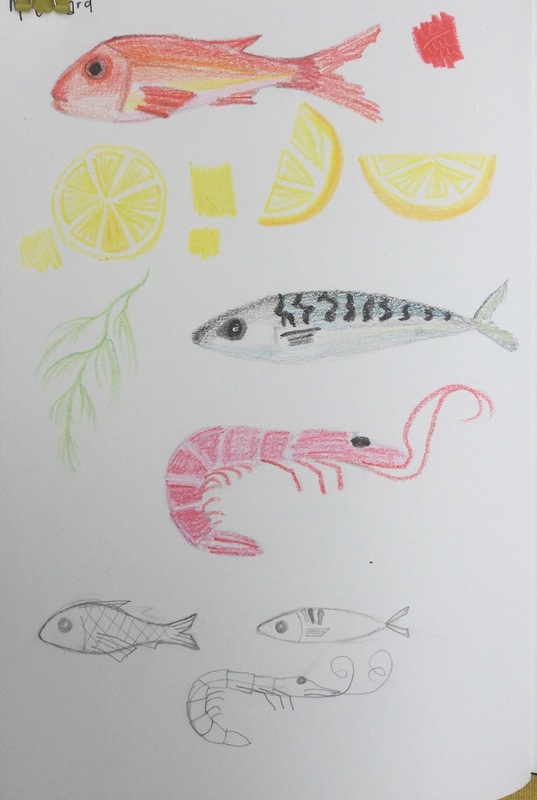 I chose the red mullet for its colour, it is bright and vibrant and I think the yellow in it ties in well with lemon which I also wanted to include in the image. I think mackerel is aesthetically beautiful and the green in its skin works well with the green of dill which is a commonly used fresh herb when cooking with fish. I chose the prawn for its shape. With two long fish shapes, I wanted to provide contrast with the curve of the prawn. I made some thumbnails to work out composition of my elements and decide on colour palette. I felt that the ‘flying’ nature of the ingredients into the pan made them appear alive and therefore fresh. For the same reason, I wanted to keep the colours bright and vibrant. To ensure the artwork was simple and clear enough I reduced the food down to its main form and used colour to provide the detail. I thought this would be a perfect opportunity to explore the technique of scraping which I had discovered when exploring tools and materials on this course previously. Referring back to that work, I decided to try out scraping away of watercolour or gouache with tools. I tried scraping away the top layer of gouache with a sharp tool to reveal colour beneath. 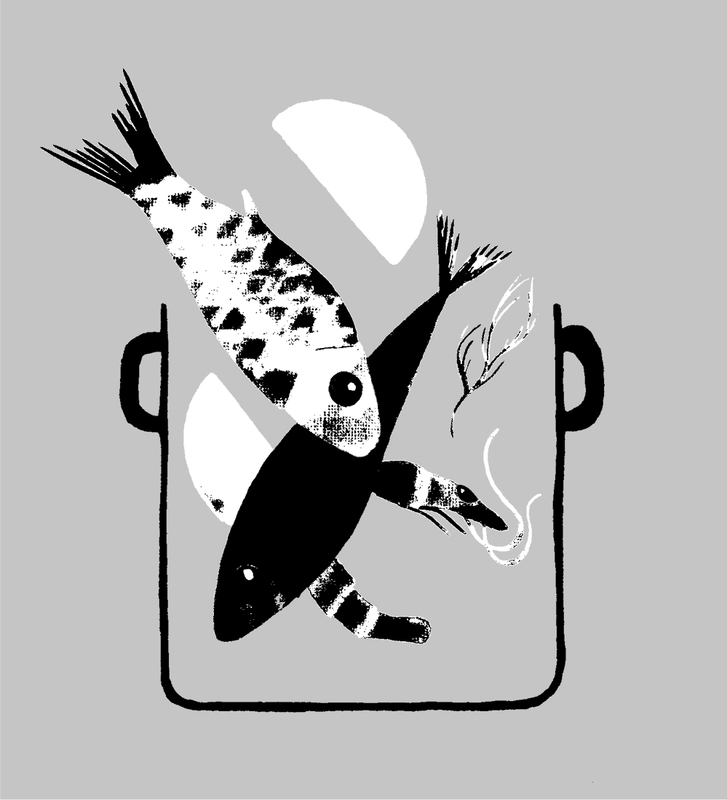 I think this would work well to depict mackerel but could end up being a bit detailed for a logo. I was really pleased with the way removing gouache with a cotton bud in simple criss cross lines created a great scaly pattern on the red mullett. I felt I was able to add detail while still keeping it simple. This method also worked well with the lemon. In the end I decided to keep it simple with the mackerel and allow the patterns to be formed by different colours of paint intermingling. My first version of the final artwork was done on mixed media paper. I was fairly happy with the result but felt that the areas that had been scraped away weren’t clear enough. I then tried again on acrylic paper because I thought the criss cross effect would add to the artwork. The scraped away areas are much clearer on acrylic paper. I then scanned the artwork in and explored colour backgrounds in photoshop. Light backgrounds looked better because they provide more contrast although I don’t feel white is quite right. In the end I decided on a pale grey. I then played about a bit with adjustments on photoshop. Black and white, auto tone, threshold and auto colour. 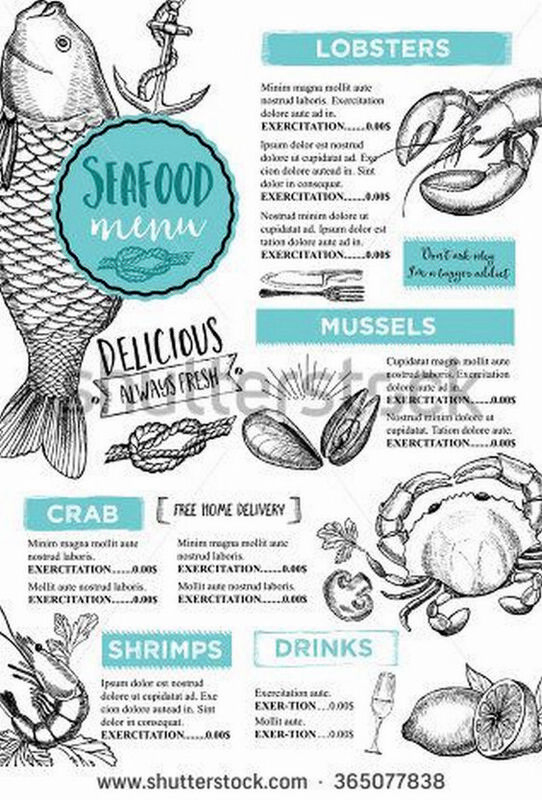 Once I was happy with my adjustments, I opened the file in illustrator and vectorised it so the restaurant can use it as a small image on their menu or large on their vans. Below you can see my vectorised image large and small. In addition to this, I also created a cut paper version in which I put the artwork off centre which I think works just as well as being in the centre. I have included a black and white version of it here to show how the restaurant could manipulate the design as they wish. Despite a slightly frustrating research process at the beginning of this exercise, I enjoyed this brief. I feel that I have been able to fulfil it while exploring my style further. I have been able to use my love of colour as detail and make it work in a really quite simple design. I think I have created a simple, clear and contemporary design which portrays a modern bright ambience akin to the restaurant. I think it tells potential customers that fresh ingredients are used in their cooking. I’m not sure whether it could be considered sophisticated enough as a design though. Perhaps a more graphic look would fulfil that part of the criteria better.